To plan and present a new exclusive mix set each month, with a new artist, representing a whole new set of sounds in an interesting way; the entire process from the beginning till the end is so rewarding, each time. And we can happily say that every Dubplate feature has been a nothing less than a stepping stone for us. The month of April is special, indeed. 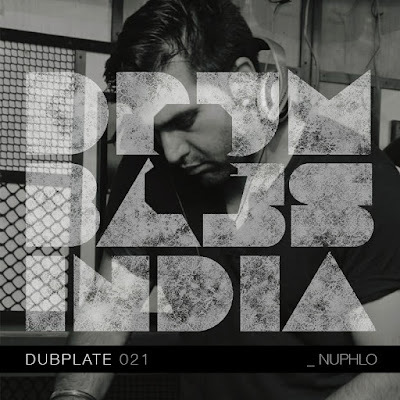 Constantly inspired from the 90s Asian Underground music, this Leeds based [Indian origin] Producer/DJ fabricates a delicate balance of eastern melodies, innovative beats and low subs. All of it started in the year of 2001, with a vision to create a quintessential blend of Asian Underground music with new, cutting edge Electronica. He has also been a very active memebr of the Nasha collective, was [and is] a synonym of 'Eastern influenced Bass music' for most of us while growing up. Having released on labels such as Nasha records (UK), High Chai records (USA), Meerkat ecordings (Sweden), Lola's World (Germany), Terminal Dusk records (USA), Boosey and Hawkes (UK), Universal records and more predominantly on Studio Rockers (UK) where he released the '40 Thieves EP' working alongside legendary producer Tony 'Moody Boyz' Thorpe. He has previously remixed for artists such as Landslide, State of Bengal, Foreign Beggars, Jazzsteppa and Boosey & Hawkes. Talking about soulful & melodic music with just the perfect touch of new sounds, it is certainly one of first few names that comes into our minds. We couldn't be any more excited to present a exclusive conversation [and a mix set] with Nuphlo. 1. Hey Mannie, how are you doing? We really appreciate you taking out the time to do this. To begin with, tell us the how did you come to chose ‘Nuphlo’ as your artist name and the story behind your choice of music? A - I am well thanks. I guess if I was to come up with an interesting answer to the first part of this question, it would be that the name is all about representing Eastern Bass music in a new way. But in reality I picked it because it just sounds cool. I like to make music that represents my identity as a second generation British Indian. The aim is to make tracks that both cultures can relate to and enjoy. 2. What do you feel about the Bass scene in the UK [where you are based out of] and what are your thoughts on its evolution so far? What do you see when you compare it with the scene here in India? A - The variety of electronic music that is available today is incredibly vast. I have been lucky to witness its development from a young age thanks to older members of my family who were into early electronic music. There are many styles I love and others not so much. But there is something for everyone and technology has given birth to a plethora of artists who can express themselves through electronic music. The scene in India is great, I feel privileged to be able to play there annually. I have met so many interesting producers, musicians, DJs and artists throughout India. 3. We have all known of ‘Nasha Collective’ while growing up and it’s been a synonym to the Eastern influenced Bass Music. Since you’ve one of the early core members of the collective, run us through the foundation and it’s journey so far. A - In my opinion Nasha Records has been the spearhead for setting the standard for the new wave of Eastern Bass music. Ges-e and Osmani sounds’ vision for the direction of this music is what has inspired my own journey. Nasha Records has been an integral part of my development as an artist. The monthly clubnights is where we all met and the outcome of our friendship was Nasha V3. The forthcoming music on Nasha Records is setting the bar even higher for the East-West sound. 4. With quite a few things going on, you also run ‘Hundred Colours Music’, which is your own label. Does the name have to do anything with ‘Sarangi’, a prominent instrument in the Indian classical culture, which also roughly means ‘100 colors’? Tell us in brief about how it works and how do you go ahead with the collaborations and releases? A - Hundred Colours Music was setup by Myself, Shandy and Osmani Sounds. Although we are still firm members of Nasha Records. HCM was setup to put out predominantly Eastern DNB rollers more frequently. In a sense it is a sister label to Nasha. The name stems from the track ‘Hundred Colours’ by the Nasha Experience. Shandy suggested the name for the label, and yes that is the origin of its meaning. With HCM, we are open to collaborations. I believe the Eastern Bass scene is underrepresented both on the Radio and through labels. So I am hoping that our label will represent those who make similar styles. We have released music by State of Bengal, Ges-E, Maneesh the Twister and Barasingha to date, with more collaborations in the pipeline. 5. Making music and also running a label, how do you find the inspiration to continuously put out good content on a regular basis? Any word of advice to people/musicians who want to work on similar lines? A - I think the current climate of tension across the UK and other parts of the world is having a positive creative effect. Particularly when the tension stems from racial/immigration point of view. As a descendent of immigrants myself I feel personally affected. I make music that brings together cultural ideas. So I believe doing this during a time of unsettlement is even more important. As for aspiring artists, just keep an open mind and expect to make a lot of mistakes. I still make many errors, but it’s how you develop from them. 6. You are also releasing an EP later in this month, ‘I am Time/Chariot’, tell us about that? What else is in store for 2017, any new albums we could look forward to? A - The next EP on HCM is out on 23rd April. The second track is collaboration with Mumbai producer ‘Barasingha’. I have also just completed my first 14 track album which will be out on London label Studio Rockers. Tony Thorpe aka The Moody Boyz has worked closely with me for the past eight years. I have released many tracks on his label and Tony has given me a greater understanding of the professional side to the music industry as well as much creative advice. He is a legend in the UK dance music scene, with an incredibly prolific career working with The KLF, The Mad Professor, Amy Winehouse to name a few. The album is entitled ‘Digital Culture Clash.’ I have collaborated with many artists and musicians and singers to bring this together. Vocals on two tracks are by Hyderabad’s Shivacult. Other artists that feature on the album are Ajay Jayanthi, Sukh Knight, Mel Gray, Tanya Jacobs, Deelite MC, MC JD, NIV and Amyn Merchant. The album artwork has also been designed by India’s Ashish Jose. There are a range of tempos on the album and I had fun making it. 7. What is your studio / live / DJ set-up? A - To make tunes I use Cubase SX2, Akai MPC 2000XL, MPC 500, Korg Volka Keys, Roland SH-32 synthesizer and a Yamaha MG12/4 mixing desk. I have a pair of Pioneer CDJ800s and a Vextax PMC-06 pro mixer to DJ (which I also used for the Drum and Bass India's Dubplate Mix). 8. Can you list 3 tunes you are feeling right now. A - Essa Weira-Night Fire on studio rockers, A dubplate by Osmani Soundz called Room 33 and many untitled dubs from GES-E.
9. What is the best gig (club/festival) you have played so far. In terms of Sound Systems, Venue and Crowd Response? A - Last summer I played at the closing party at Blue Frog Mumbai (Frogfest). I have never been in a club with so many people. There wasn’t room to breathe. 10. What's the funniest / craziest thing that has ever happened to you during a gig? A : Early on I used to DJ at an Asian underground night in Leeds called ‘Kushboo.’ On one occasion after a classical performance by a local musician, I started my set with some heavy DnB. I remember the shocked expression on people’s faces. It was a learning curve in that you need to hook your audience with an enticing intro track, once you have them you can take them on a journey anywhere. 11. You just found out that your last gig ever is tomorrow, what would be your closing track? A : Black Star Liner – Harmon Dub. 12. An absolute favourite city/venue in India that you love coming back to? A : Bass Sanskriti in Hyderabad. Spending time with the Monkey Radio KRU down there is always a pleasure. I have been going there for the past three years and each time is always special. Rahul Mangal who manages my gigs is also a member of the KRU. The crowd in Hyderabad connect well to the Eastern Bass vibes.